Libby Pritchett Designs: Lions and Tigers and Sheep, Oh my! Lions and Tigers and Sheep, Oh my! We had a little Halloween photo shoot yesterday. Over the years, I've learned it's so much easier to get good pictures if we just dress up BEFORE halloween night when all the chaos hits. I took a ton, but here are a couple of my favorites. 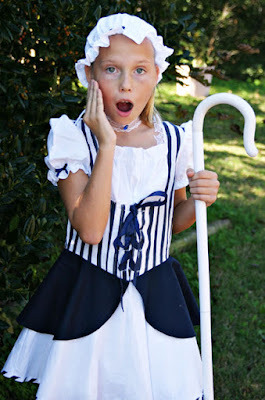 This is Little Bo Peep, and by the looks of this picture, she's just discovered her sheep are missing. 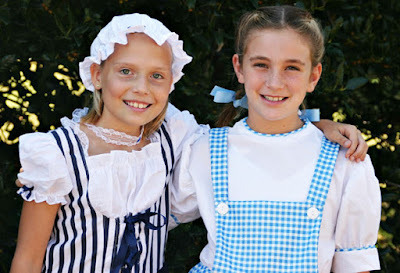 And here she is hanging out with her best friend Dorothy. In other news, my dad goes back to have his second surgery for his skin cancer today. This has been such a major ordeal. And Marti (dh) goes tomorrow to have a scan done to hopefully get some answers about what is WRONG with him. Between the pain and the weight loss, we're ready to know what's going on. That's it for today. Be sure and check back. Lots of fun going on later this week with Digital Scrapbook Day on Saturday! what a cutie Libby!!! She's gorgeous! Hope things went well with your Dad and hubby's feeling better soon. yikes. They both look so good! !